The hot stones beneath my bare feet were what urged me to toddle around the Belur temple, as fast as I possibly could, without compromising on the prayers I was forced to lisp along the way. This was my earliest power walk and I sometimes still walk like there are hot stones propelling me to take the next step, and the next. I have a good memory. I remember things that I should be far too young to remember with peculiar clarity. The first dinosaur book I’d received and lost, and the long list of dinosaur names, papa’s first scooter, the day I split open my chin when I took a fall, everything is vivid in separate categories of my mind. There’s a picture in an old, hardbound album. A small picture with white borders fixed on a huge empty page. 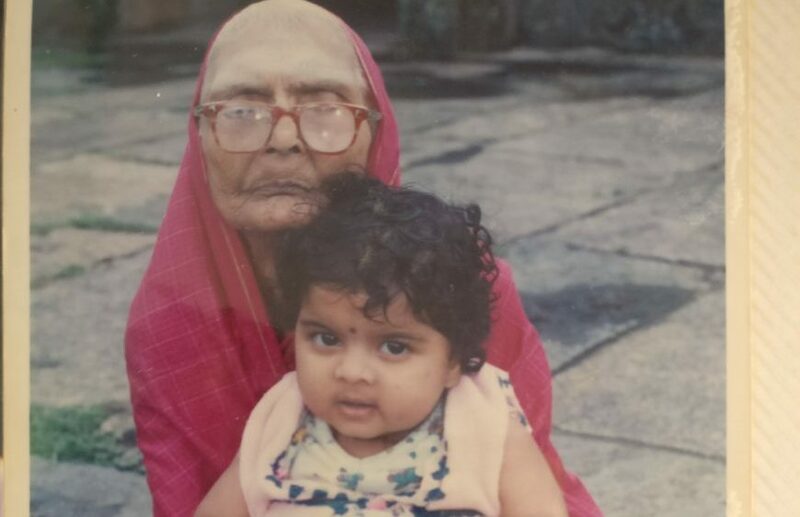 It’s of baby me sitting on my great-grandmother’s lap on the temple steps. My two-year-old chubby body seemed to dwarf her ninety-two year old frail self. I always picture myself tumbling into her bony arms after running around the stone pillars, where she picked me up and sat me on her lap for the photograph. At that point, she was too weak to hold up a tatte and lota, let alone a healthy baby, I’m told. But I like to think that Puttajji laughed at my efforts to run straight without falling and carried me before I tired myself out. Born in 1906 to an orthodox Brahmin family in a heavily caste dominated society, Puttajji had somewhat of a revolutionary attitude. She was widowed at 17 and raised her son by herself. Being a single mother shunned by society wasn’t any easier then, but not once had she complained. She sat stoic in her nine-yards-saree when Mudalagiri, the barber, tonsured her every month, after which she was treated like an untouchable until “cleansed.” A strong sense of anti-discrimination dominated her beliefs. She was the first person in the family who welcomed my parents’ inter-caste marriage with open arms. This, I think, was a result of being at the mercy of a casteist society for more than 80 years, which probably chipped away at the narrow-minded ideas she was raised with. No one remembers when she started having problems perceiving the reality around her. She would scream and panic and try to run on her weak legs, and none of them knew what she was going through. They thought she was feeling lonely, or that she wanted food. Once an active woman who would climb five feet high compound walls at sixty-five years of age to pluck flowers, now lay wasting away on a carpet below the huge showcase. The day she passed away, she was still on the carpet and had wanted to eat chappati-chatnipudi for lunch. From her behavior, it isn’t hard to figure out now that she was schizophrenic. Paranoid schizophrenia, if I’m not wrong. She was terrified that someone would harm her, her son, her family. And she died with a desperate urge to run away. A few months back, during one of the biannual trips to Belur, I walked around the temple again. This time, though, my feet relaxed on the rough granite. The stones were familiar and kept me grounded, constantly shooting warmth up the soles of my feet. I realized then that Puttajji didn’t feel the scorching heat uncomfortable as her body was dropping temperature as days passed. She loved the heat, I think, because it made her numb fingers and toes shriek with life when she removed her shawl. I leisurely marched to the small water body off to the side. The sun was batting away the mist coiled around the green water, burning the stones around it. The metallic smell of stone and stale water was foreign, and didn’t trigger any memories of lingering children or ice-lollies. It takes me five minutes to walk from the Belur maney to the temple. It takes my grandmother, Doddajji, thirty minutes to do the same. She speaks of her mother-in-law, Puttajji, and comments on how she had trouble walking as well. She always holds on to my hand when we walk together, like I’m a child who would run away at the sight of pinwheels if she didn’t. I think this gives her the comfort of taking care of someone again, instead of the other way round; in charge of a situation like she was twenty years ago. She nudges me this way and that, making way for the cattle sauntering down the main road. I let her guide me, and carry her weight on my arm. I have inherited my wide feet from her. Our fourth toes point towards the big toe, and our second toes are the longest ones out of all. Our feet are flat. Every time I crib about this, she chastises me for not realizing how much luck my flat feet have brought me. We’re both always tripping over these lucky feet. Doddajji is now 85. She constantly walks to the backyard to pick up the clothes she thinks she’d washed in the morning and put out to dry. She hasn’t washed clothes in decades. She slowly makes her way through the corridor to reach the backdoor, her pronounced limp making a soothing rhythm of footsteps scratching concrete—ta tut ta tut ta tut, and sees no clothes on the line. She holds on to the wall and makes her way back. The doctors have diagnosed her with severe dementia. After the revelation that people in my family have suffered from mental disorders, I couldn’t bear to spend any more time in that town. It terrifies my inner control freak that one day my mind won’t be strong enough to deal with reality. The one thing I pride myself on is my mind. And the people, my ajjis, affected were highly intelligent women with a mental clarity that rivaled everyone else’s in the family. I never want my mind to crumble under the pressures of old age or the life continuing around me. It’s not a happy thought that the world will become sane, or be saner still, without me. I’ve spent less time in Belur than any other place I call home. I hate going to Belur, not because it’s small and there’s nothing to do, but because I never manage to leave there unscathed. Witnessing deteriorating mental health, atrophying muscles, the drama of house deeds; everything manages to leave an uncomfortable pressure behind my ears. I widen my jaws hoping the pressure would pop. It intensifies. My eyes thrum with the numb sounds leaving my ears and I’ve started pacing without noticing it. I’ve walked out of the house, my feet are bare. I’m petting the cow resting her head on the kallina katte. I once decided to walk to the end of Belur, figuring I’d make my mind focus on the ache in the soles of my feet instead of the house of horrors. I kept looking around, wondering where all the vehicles were as they definitely weren’t on the road. Even the bikes here looked modest; none of them had passenger seats flying in the air looking like they were suspended by opposing gravitational forces. I doubled back, doing the mooru pradakshne around the temple before continuing on agonisingly safe streets. There was a signpost near the petrol pump, it asked me to take a right if I wanted to go to Halebidu. I chose not to and took a left. It took me twenty minutes to reach my destination, the end of the disturbing town. It was an unfulfilling task. There was no lake or ravine I could shout my frustration at. But there was a Hoysala emblem on a triangular patch of grass, enclosed within a black iron fence with posh lights that glow amber instead of white. I remember thinking how it quite contrasted with the woman carrying a bale of hay on her head and a tiny baby on her waist. I return every year and walk the twenty minutes, hoping there’s more to walk towards, that there’s some wide, open space where I can dramatically let go of the fears bothering me. I end up sitting on the patch of grass and watching bullock carts go by. My screams have died behind my clenched teeth. My mind, for now, belongs to my feet. However much I pride myself on memory, I should admit that my sense of direction is dismal. I can picture the roads perfectly in my head, but I’ve never been able to figure out where I am in this picture. I was four years old when my van uncle decided to abandon me on a muddy street when the van broke down. I remember him telling me to walk back home. I was pouting: how dare he ask me to dirty my polished shoes. Hitching my bag onto my shoulders, and with my water bottle hanging from my neck, I walked towards a familiar looking house and was immediately lost. I wandered around, scared by my shadow. Literally. My two ponytails looked like a devil’s horns and I quickly undid them. I was chased by dogs and got called out to by old people needing my help. I sped up. I was the one who needed help. I hated the van uncle. I couldn’t walk anymore and my shoes were dirty. One boy, my mamma’s tuition student, came across me sitting in the middle of the road, bawling. He picked me up, my discarded bag and bottle, and carried me home. Apparently, my house was in the parallel street. That day, mamma took me around the area, making sure I knew the way to get back home, no matter where I stood. Every muddy street and house was pointed out to, and we made up stories to help me connect the dots. When we shifted to a new place, I still dreamt of the streets that led to my previous home for at least a year until I acquainted myself with the new streets. It felt like betrayal to forget the street I was abandoned on. I’ve never been much of a walker. I’d rarely been allowed to walk—I preferred piggyback rides—almost until I was 13. Walking, now, is a borrowed pleasure. I don’t know who passed it on to me, but it’s undoubtedly not my love. And when I did start walking a lot, it was because it became a necessity after work. The bus stop was conveniently too close, and too far at the same time, for an auto to be of service. It was on MG Road on one of these after-work walks that I indulged in what I had previously thought were sunflower seeds. The channa choor tasted like lemon and the glossy magazine page it was packed it. The salt in it gathered at the corners of my mouth, making me flick my tongue repeatedly to catch the granules. The tomatoes and onions for the snack were chopped up with a square-ish knife, a dirty knife that I refused to look at, and dumped in with the rest of the flakes. All this time my head was swivelling uncontrollably, trying to catch glimpses of everything I’d missed on the street while nibbling on the faded yellow flakes. The last leg of my internship saw me walking down the busy road with a paper cone in one hand while the smoke from the roasted groundnuts’ cart dogged my heels. I had walked down MG with my mother, right after the metro was built, in a rare occurrence. Mamma’s patella is weak now, and had been even then. We were walking along, looking for ice cream, when she started wildly pointing out to places and reminiscing. Indian Coffee House was where she had her dates with papa, right next to Barton center. Then they’d go to Lakeview and shared a huge milkshake before hitting Koshy’s for a beer. There were three theatres she’d forgotten weren’t there. We could have gone to either Blue Moon, or Blue Diamond, or Plaza, she said, to catch a movie if they were still around. There was a moment when she stared at the lane and the old and the new merged for her, and all I could see was how she was before I came into the picture. She seemed older and more a part of the city, like Bangalore had more of a hold on her than I did. I was envious, yes, but I didn’t know if it was of mamma or the city. It was in school, somewhere in sixth grade, when I realized that I had a weird way of deciding where to step. I’d place my feet on the darker tiles, picturing the colour seeping out because of my step, ensuring that all tiles would be the same shade of pink, before I took the next step. I had become obsessive about this, and it sometimes still determines where I place my foot. After the initial steps and wonderment of walking the unfamiliar, the activity becomes unconscious again. Moving does, after all, keep my mind occupied, and I can’t let the anchor of my thoughts develop into something I need to be aware of. Resident of the Fantasy world. You can reach me through owl posts. An avid reader and obsessively compulsive about organising everything. Aspiring mountain climber. Student of St. Joseph's college, UG, second year. One of the few remaining specimens of native Bangaloreans.